You have a variety of options for building or buying cold frames . It can easily cost $200 for a small commercial cold frame that only covers 8 square feet. I decided to create my own cold frames for less than $50 to cover a standard 4′ x 4′ raised bed. Whenever possible, I place my winter garden beds on ground that slopes to the south, to gain the most solar heat. Then I build a simple frame from 2″ x 8″ lumber. This height will handle many types of winter greens and root crops. I'll sometimes start kale later than usual (Sept 1st or so), about 6″ apart, so that it will only grow 6-8 inches high before winter and can fit inside my standard cold frames. You will need to cover full grown kale with hoops of row cover or clear plastic sheets (mini hoop tunnels). Some people build similar frames with sloping sides, so that the top of the cold frames slant to the south. In my moderate climate (zone 6b), I haven't found that necessary for successful winter crops, so I keep my construction simpler. My friend and apprentice, Cameron, helped to build my cold frames. Here is the wooden frame for the cover to the cold frame. A simple and cheap frame for the cover of a cold frame. Then he cut and stapled heavy-duty row cover spread tightly across this frame. We folded the fabric over several times on the sides so that the staples would not pull through the fabric. In my climate, this cold frame cover made from heavy-duty floating row cover gives adequate protection for my plants for most of the winter. It allows rain and 50-70% of the sunshine to pass through, while offering good wind protection and several degrees of frost protection. I don't remove the cover to ventilate the cold frame unless the temperature reaches the mid-60's or higher. This cover is also strong enough to support 6-7 inches of wet snow – possibly more, but that is all I've had to test it with so far. I haven't had these covers blow off with strong winds, though my covers made with plastic sheets have. It is easy to hold them down using bungee cords. Bungee cords are a very easy way to secure cold frame covers. I've also experimented with covers made from cheap clear plastic sheets. The downside of using this is that the plastic will stretch from the weight of snow and heavy rain, and sag very badly. I ended up having to punch a couple of small holes in the sheet to allow rain to drain through. You can use cheap sheets of clear plastic over your cold frames, but the plastic will stretch badly with snow and heavy rain. If I wanted to use cheap plastic sheets again, I would probably staple hardware cloth over the frame first (underneath the plastic), to keep it from sagging. Cheap plastic would only last one winter, but I could then use the cover with just the hardware cloth (on top of the cold frame base) during the growing season to keep birds, chipmunks or other pests away from seedlings or ripe strawberries. 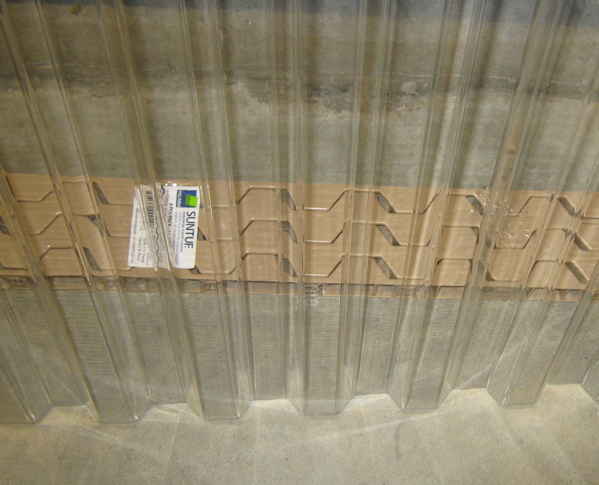 A great option for a clear, solid cold frame cover would be to use SunTuf™, a very clear corrugated polycarbonate plastic. I would use that if I had frequent heavy snows, temps below 10 F, or excess rainfall that I wanted to keep out of my winter beds. Some people use old glass windows to cover their beds or other types of lightweight plastic, such as twinwall polycarbonate. Twinwall polycarbonate offers better insulation during more severe winters. Be aware that some types of cheaper fiberglass sheets will turn yellow and become very brittle in just a few years. I choose to use solid covers on my cold frames only during extremely cold weather (below 10 F) or prolonged heavy rainfalls. The disadvantages of solid cold frame covers is that you will need to regularly open and ventilate your cold frames – how often depends on your climate. A sunny 30 degree winter day can badly overheat your winter crops. If you want to use an Automatic Vent Opener , you will need to use plastic or polycarbonate covers, as these vents cannot lift heavy glass covers. These automatic vents don't use electricity; they use a special type of wax inside a cylinder – this wax expands in warm temperatures and shrinks back down again when it gets cold. Solid covers also prevent rain from watering the soil in your cold frame beds. If you live in a very cold winter climate, you may be able to go a couple of months without your soil drying out. But in warmer zones such as my own, my beds often dry out very quickly if I use plastic or glass over my cold frames, and then I usually need to water them by hand nearly every week throughout the winter. This is one more reason that I mostly use row covers over my beds. As winter approaches, it's important to keep your cold frames cooler, generally no warmer than 60-65 degrees F. Warmer is not better in winter! If your plants spend a lot of time in a very warm environment, they won't be able to tolerate really cold weather. When your winter crops experience frosts and freezes, they create sugars to build up natural “anti-freeze” in their tissues. That's why these crops taste so much sweeter in cold weather than warm weather, and why they can handle repeated freezing and thawing. IMPORTANT: You should never harvest your winter crops when they are frozen. Most of them will turn to mush when they thaw after being harvested when frozen. Most cold frames will warm up enough to thaw your plants for a few hours each day, even during very cold weather, if they receive some sunshine. Even in mid-winter, you can usually harvest crops at least once or twice a week when your cold frames warm up during a sunny spell. If you screw wood frame trellises to the outside of wooden raised beds, you can leave them in place while you use a cold frame over the raised bed. I had thought that it would be a great idea to hang the cold frame cover on the trellis when I didn't need it set over the bed, BUT a very strong wind caught the cover like a large sail and tore the trellis right off the bed! So, don't do what I did! Cameron and his younger brother, Casey, built this simple trellis and screwed it to the wood framed bed. I also use cold frames to cover mulched beds of carrots, beets, and turnips. When the fall temperatures drop into the low 20's, I cut off the leaves from the crops and cover the roots with 6-8 inches of mulch – such as dried grass cuttings, shredded leaves, or straw. This is one bed that I always use with solid clear covers, to keep the rain off my dry mulch. The mulch will keep the soil from drying out and prevent most of the soil from freezing. Whenever I want to harvest the roots, I remove the cover, push aside the mulch, and collect what I need. 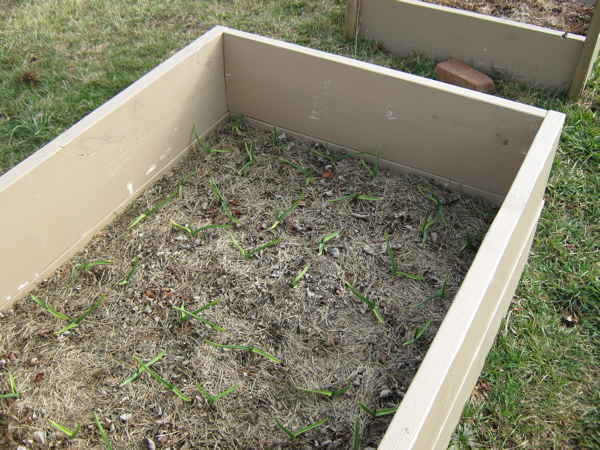 If your raised beds are 6-8″ tall, the soil may freeze a few inches in from the sides during severely cold weather. I usually harvest my root crops from the sides of the bed first. 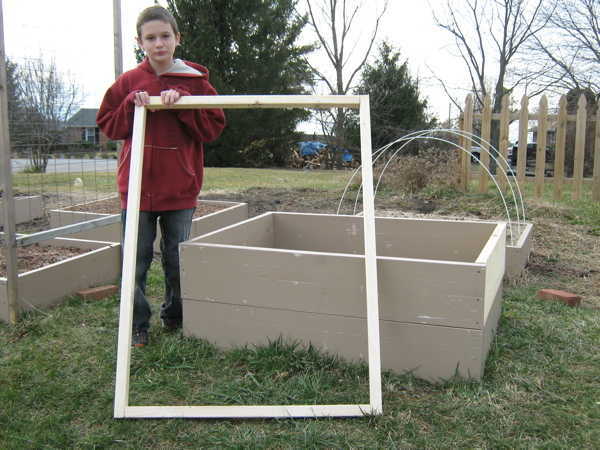 There are many other ways to build cold frames or mini hoop tunnels. The books Four-Season Harvest: Organic Vegetables from Your Home Garden All Year Long , by Eliot Coleman, and The Year-Round Vegetable Gardener: How to Grow Your Own Food 365 Days a Year, No Matter Where You Live , by Niki Jabbour, describe a variety of options. Niki's book has many great photos, too.